Globes are not as common as they once were. They were a staple item in the classroom, library and even in bedrooms. Software and websites have since replaced the need to have a physical globe. Even so, they can hold some sentimental value to someone. They look cozy in a home when they're tucked away on a shelf in the living room, on a table in an office, or even hanging from a ceiling in a child’s bedroom. 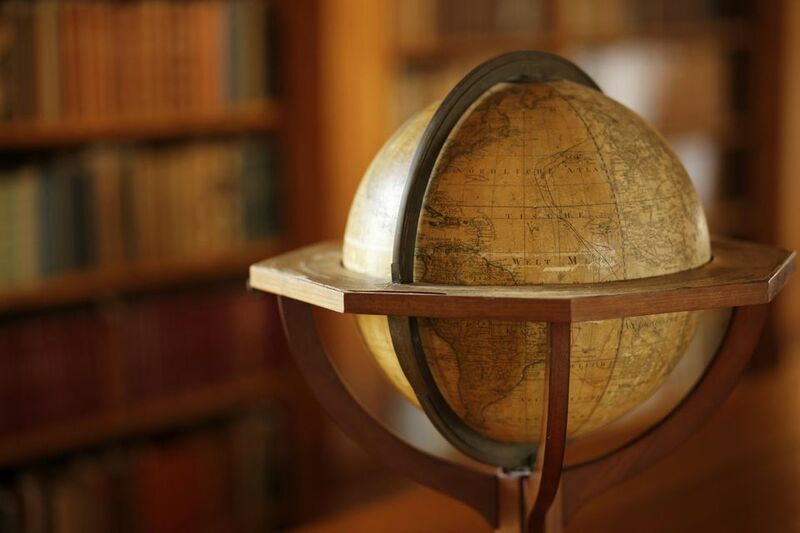 If you’re looking for a well-built, solid globe with character (search for old globes with countries since renamed), check out thrift stores, garage sales, flea markets, and swap shops. Look for the best deals; just because it’s vintage does not mean you should fork over a lot of dough. After you bring your globe home, evaluate its condition. Are there any faded or rubbed off sections of the map? Are there any scratches on the pedestal? Also, determine whether you’d like to transform your globe into something more unique or to fit your current style. For example, you can paint the pedestal or stand a bright, vibrant color. Depending on where you purchased (or acquired) the globe, there may be a nice collection of dust, cobwebs or other dinginess. To clean the globe, wipe off the entire ball with a clean, dry, soft cloth. Stay away from sponges or paper towels since the texture of these items may rub off the map image or scratch any other surfaces. To clean the pedestal, wipe off the stand and any other metal pieces with a damp rag. Do not spray or wet the rag near the ball (you don’t want any overspray to land on the globe and ruin the map) or soak the rag too much (you don’t want it to drip on the globe). If you want to give the globe a new look, think about painting the stand and/or pedestal a different color. If the stand and/or pedestal are heavily scratched, you may also want to think about re-painting it to look more polished. To paint the stand, pedestal or any other metal pieces, wrap the globe in a newspaper to protect it from any overspray or dripped paint. Do not apply tape to the surface of the globe (you don’t want the map to peel off when you remove the tape). Try to wrap the paper around tightly and tape the paper to paper. After the globe is fully covered, paint the globe in your choice of color. To quicken the process, try to use a 2 in 1 primer/paint combination. These usually come in a spray can. If you don’t use a 2 in 1 primer/paint combination, apply a few coats of primer first and then your choice of paint. It’s really up to you on which type of painting method you want to use. Let the primer and paint completely dry, and then carefully remove the paper from around the globe. Does your globe have any rubbed off sections or scratches? Spot repair these sections with a little bit of craft paint or even watercolors to cover up these blemishes. Use a very small craft paint brush and only a little bit of paint. Carefully dabble the paint on the damaged area and let dry. Use a fine black marker or pencil to touch up words if you have a steady hand. For best results, try using a magnifying glass or glasses to get a closer look at the area you are repairing.